Another discrepancy with 8466 is the OA logo, the colors are reversed. I also have Guy E. Martins book and noticed the errors. 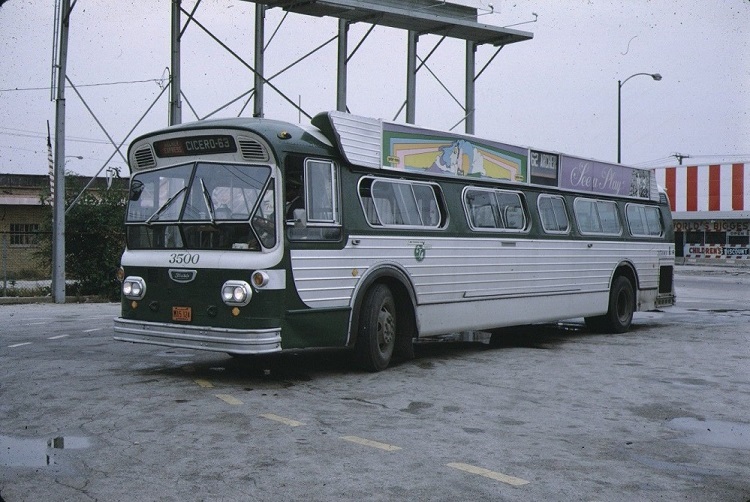 Some models were repeated in the photos while others were left out such as the NYCTA non AC new look Flxibles. 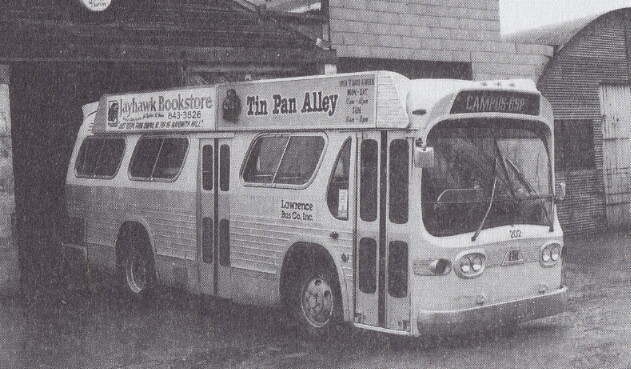 After the last time the Grumman's were removed from service, some of the 8000 series buses were taken out of retirement storage and returned for a short while with the batwing ads racks removed. As seen below 8041 on the B41 in service without batwings. Photo credit to Doug Grotjahn posted on the TTMG.Org website. 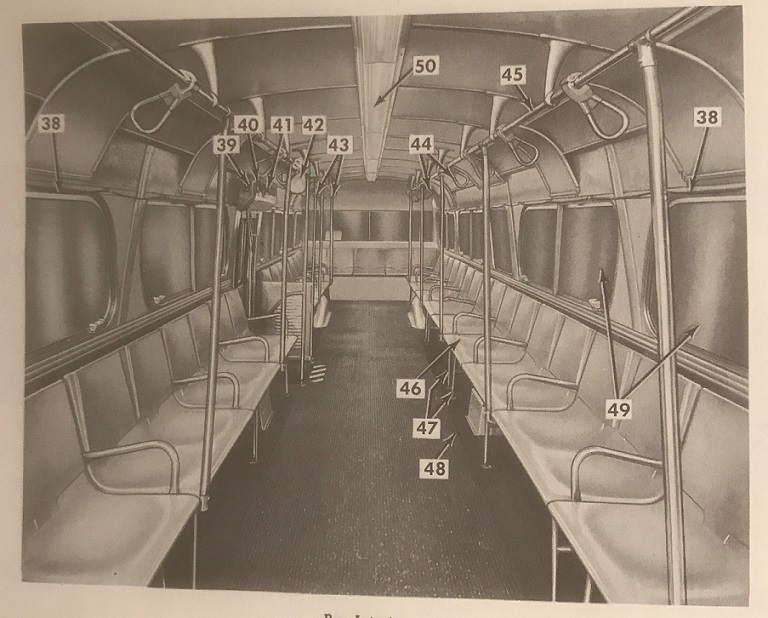 I, in all honesty, am truly in great awe of your tremendous wealth of knowledge, regarding bygone New York buses and their operations; it truly amazes me, since it is quite clear that you gents are virtually walking encyclopedias on the subject! Your in-depth input, and wonderful old photos have truly made this topic a detailed and most fascinating one! 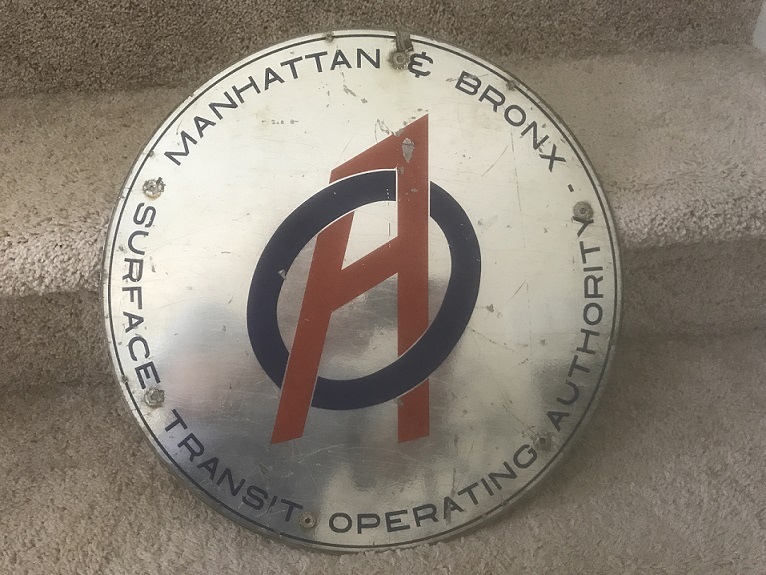 This is the "OA" emblem that was placed on the batwings. As you can see it was a metal circle not a decal on the actual anodized "wing"
These photos show the mechanism how the drivers changed the side signs. To the left of the driver between the door control handle and engine start button were two toggle switches. One controlled the up & down curtain movement (street side) the other was the master switch. On the rear door mechanism housing were two buttons that controlled the up/down curtain movement on the curb side. 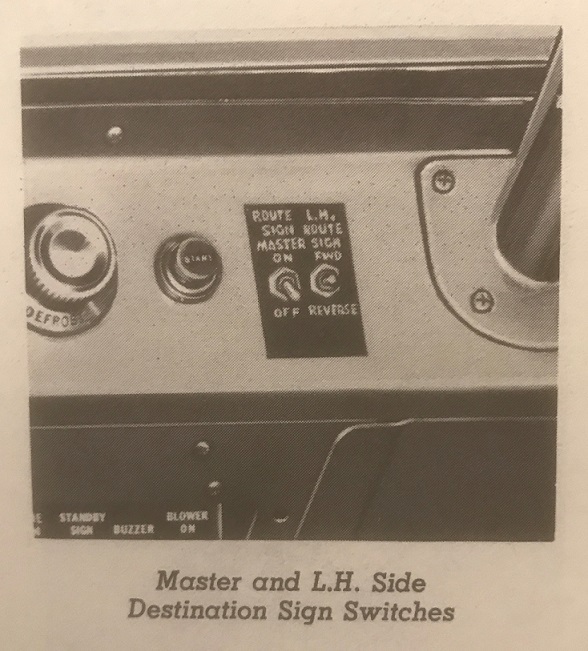 The master switch had to be set to "off" once the signs were moved. This prevented any unwanted sign change. 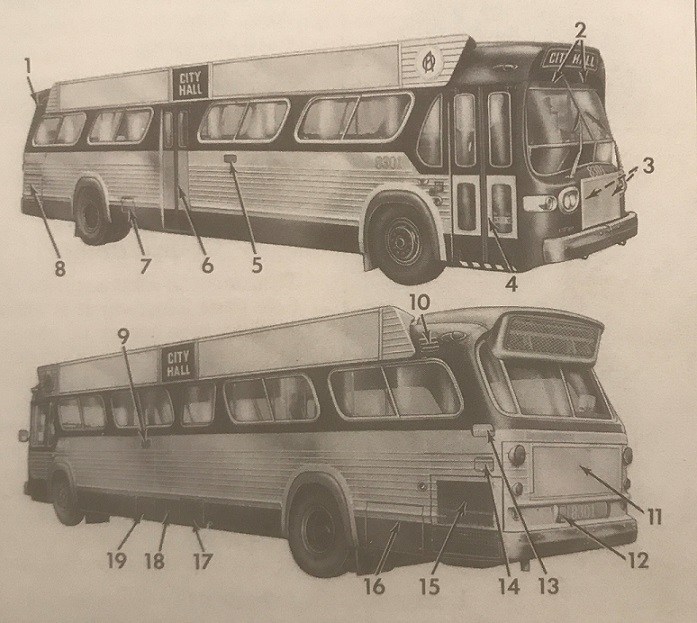 These photos are from the Operating Manual issued to OA and TA drivers for these buses. The first time I saw this book was on the coin tray of an M104 I took in Times Square on the way to the UN. I knew I wanted that booklet... finally got it 40+ years later from EBay. IMHO these buses were the best buses in the fleet. These two are also from the operating manual. This is the actual appearance of the interior of the buses far from the current seating arrangement found in the preserved 8466. 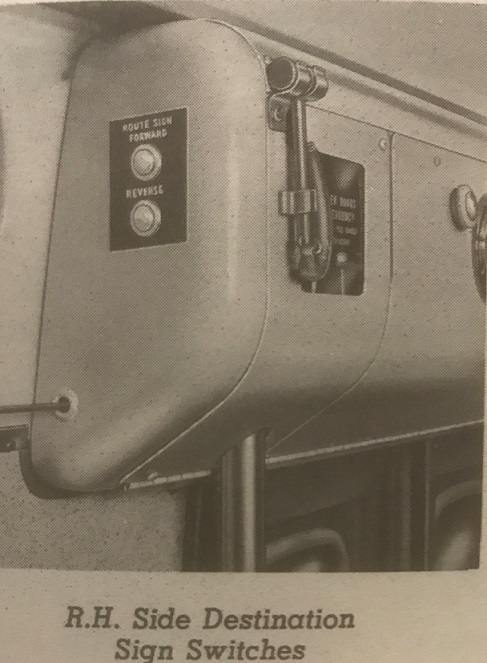 Item #14 is a "Parking Lot heating connector" this was found on NYCTA buses only, fleet numbers 8001-8201, since they had a larger number of open air storage yards. The only other difference between the "OA" and "TA" buses were the hard plastic seats. The OA were chiffon green and the TA had light grey seats. 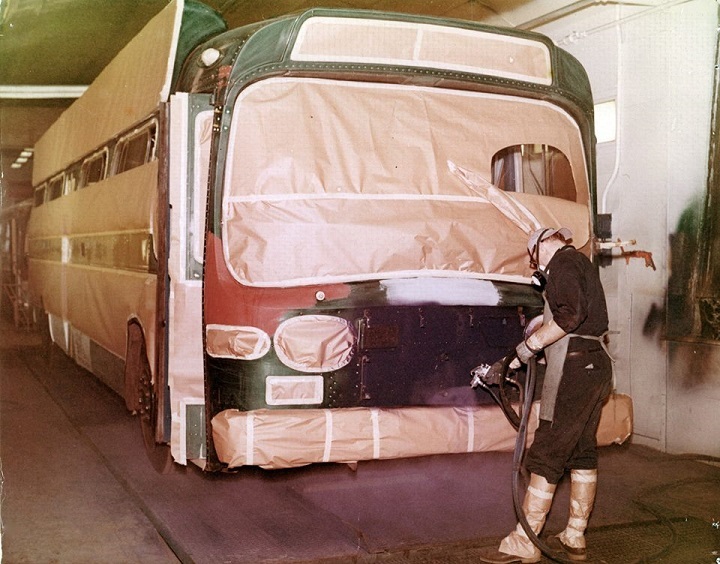 The first 'dual order' for GM of TA and OA buses since 1963 when OA 3301-3555 and TA 3601-3950 were built; and the second altogether (after the 1965 GM buses for OA and Flxible buses for TA) to have the rear windows built as 4-piece. 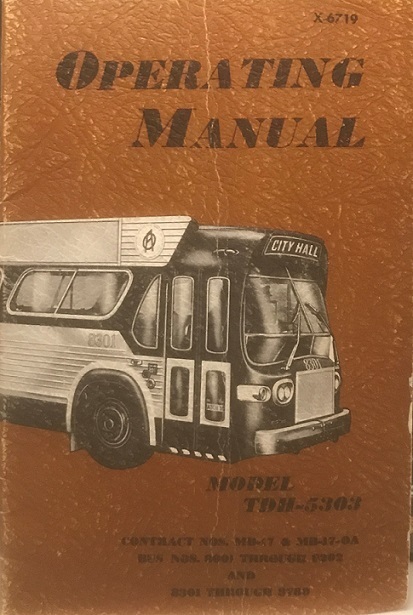 Every so often on eBay a maintenance manual for the 1964-65 group (5201-5525, contract #MB-15-OA) turns up, would anyone around here be in possession of the 1965 operation or maintenance manual for the 6401-6900 group (contract #MB-16-OA) and whether it would be shown in their illustrations as non-batwing or batwing? LOVE that CTA New Look!!!!!!!!!!! A GM TDH-5303 getting a facelift... it appears that it's getting repainted into the two-tone blue scheme. 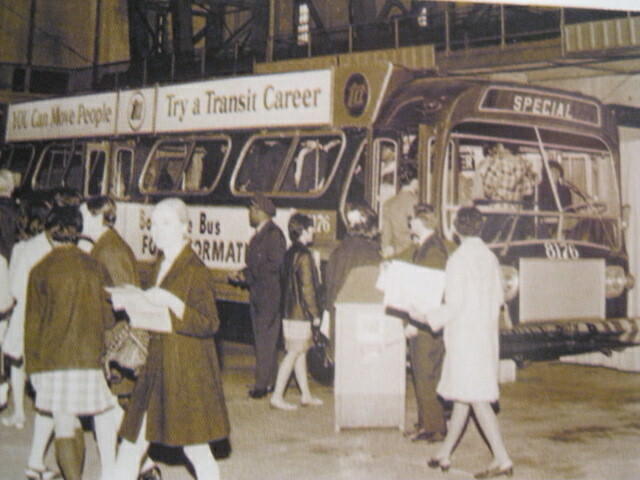 An NYCTA batwing, #8176, advertising "A Transit Career" in the Grand Central Terminal concourse. KEEP UP THE OUTSTANDING WORK!!!!!! !